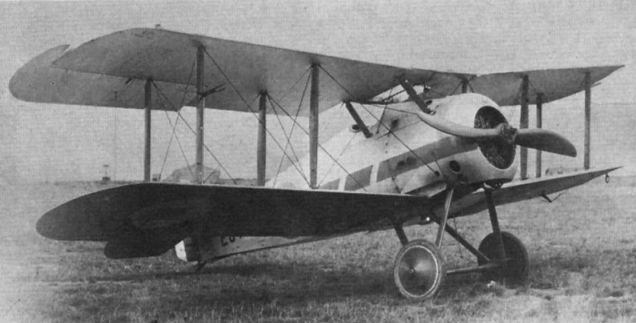 A Sopwith 7F.1 Snipe from one of the "E" serial batches, this example carries the blue and white stripe of 32 Squadron, based at RAF Kenley in the early 1920s. The engine is a 230 h.p. Bentley B.R.2 rotary. De Havilland D.H.9A E726 was built by Whitehead Aircraft Ltd of Richmond, Surrey. It features a lengthy exhaust pipe extending almost to the tailplane, and is fully equipped for night flying, with lights on the top wing and flare-brackets forward of the skids on the lower wing tips. De Havilland D.H.9A E850 Perseus was famed for its longevity of service with No 47 Squadron, based at Helwan, Egypt. It is seen here making dropping trials with "Karma-Potter" supply parachutes. Its C of A was renewed three times. 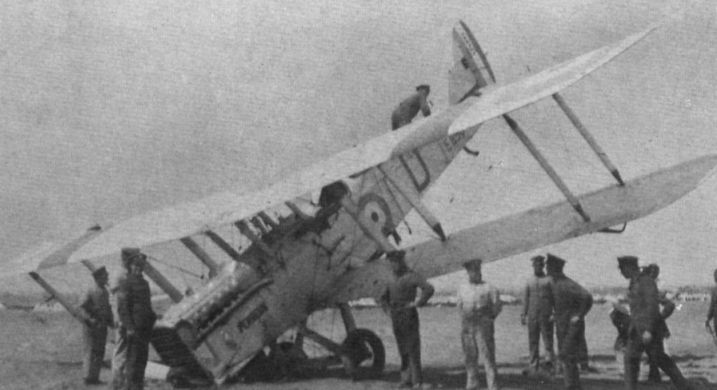 The long-serving D.H.9A E850 Perseus of 47 Squadron, Helwan, Egypt, after an unhappy but not-too-disastrous landing in 1926. This venerable aeroplane was "aerobatted" on its final flight. 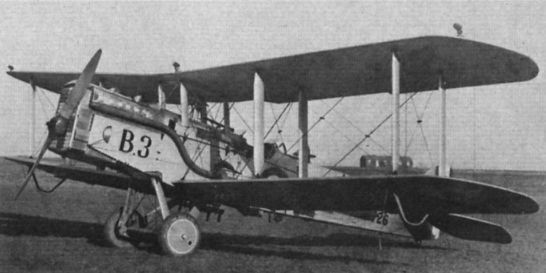 Vickers F.B.27 Vimy F8631, with a pair of 360 h.p. Rolls-Royce Eagle VIII engines, in the clear-doped finish adopted after the First World War and displaying the distinctive nose skid. Armstrong-Whitworth Siskin IIIDC two-seat trainer J7S52 bears the black line of 111 Squadron, based at Duxford, along its fuselage. This Squadron re-equipped with the type in 1924, being the second unit to do so. Most Siskin squadrons had two-seat variants on strength. K3588 was the Vickers 210 Vespa VII, previously Vespa I G-EBLD and Vespa II and VI G-ABTL/O-S. First flown in September 1925, the aircraft had a long and varied history. On September 16, 1932, Bristol's chief test pilot, Cyril Uwins, flew it to a new world altitude record of 43,976ft, a Bristol Pegasus "S" supercharged engine being fitted for this flight. It is seen at the RAF Display, Hendon, in 1933, shortly after its acquisition by the RAF in June of that year for high-altitude research. Fairey Fox I J7956, c/n F862, powered by a 480 h.p. Curtiss D-12 engine. The fin bears the numeral "12" - the only Squadron equipped with this superb two-seat day bomber. A fox’s head became 12 Squadron's emblem, and later adorned the rudder of their aircraft. 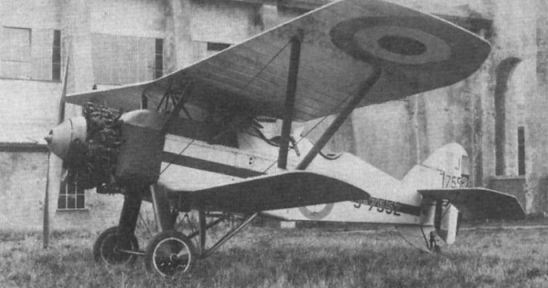 A brace of Hawker Woodcock IIs, fitted with the 420 h.p. Bristol Jupiter IV. 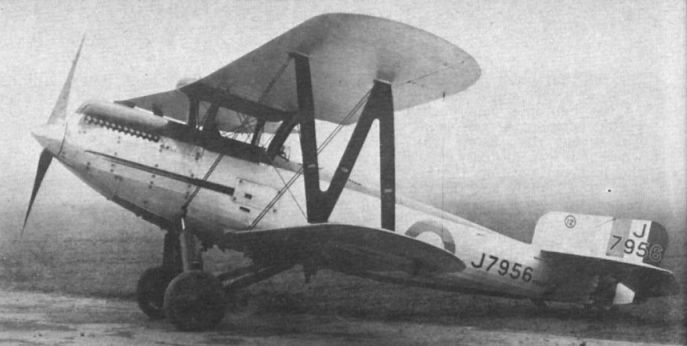 The foremost aircraft, J7515, was the fourth production aircraft. On July 1925 it was flown by Fit Lt P. W. S. Bulman in the King's Cup Race as G-EBMA, the only civil Woodcock, but crashed at Luton.